Limestone hills soaring like sentries above bleak and barren bogs and wide expanse of rice fields welcome me. The land here is a sea of olive-green dominated by these gorgeous mammoths so ancient that it dates back to the forgotten ages of the earth’s beginning. Time seems to stand still, and only the sound of the river flowing, the cooing of the birds and the mountain goats may break the silence. I am in Tam Coc, beautifully nestled in Ninh Binh province known as the “Halong Bay in Rice Paddies” for its karts-strewn rice fields and as home of Vietnam’s 10-11th century capital Hoa Lu. 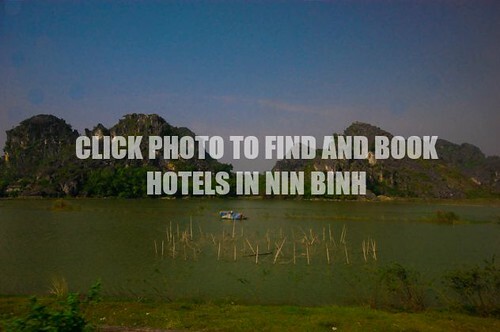 My trusty Vietnamese guide suggests he knows another jump-off point, with lesser tourists and no persistent vendors. “It’s cheaper and it’s just the same river and grottoes,” he reveals in an effort to convince me. Riding at the back of his good old trusty motorbike, he then takes me to the other side of Ngo Dong River where garnet-painted metal boats and women paddlers await tourists. A bright-eyed, obliging woman sporting a conical hat seizes her opportunity and offers me a ride out onto the placid river. 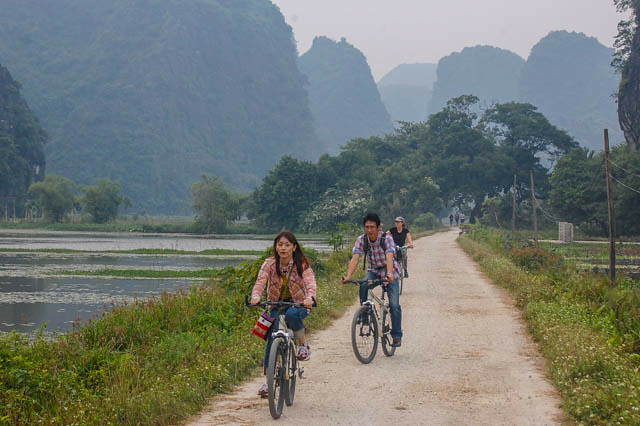 I board the metal hull, and she gently rows past brick-roofed houses, men cleaning their rusty motorbikes and water buffalos grazing in the lush valley. 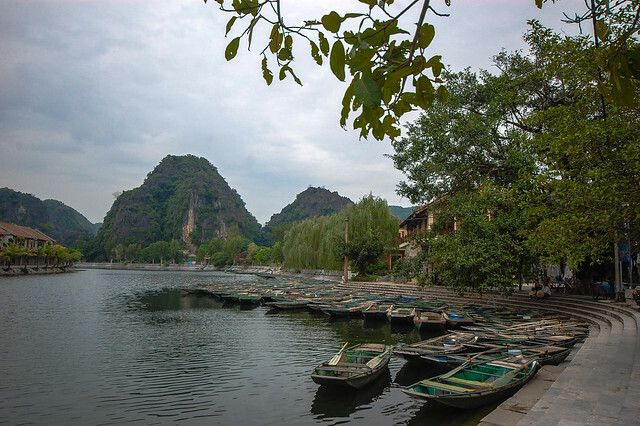 Suddenly, my rower who can’t speak English signals to the mountain and points towards a mountain goat, one of the main residents of Ninh Binh and a popular ingredient for local cuisines. 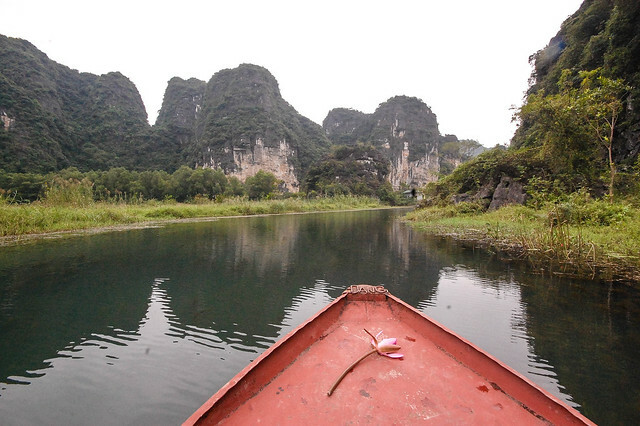 Our unassuming boat floats like a tiny toy around magnificent limestone masses sprinkled around serene river, while the gloomy silence lends mystery to the surrounding vivid landscape. Ngo Dong River is rich in varieties of flora and fauna, bringing with it discoveries and adventures. Visitors take pleasures in nature’s sublime beauty here, a perfect place to unwind especially for city dwellers. After about a few minutes, we reach an underground river grotto, a fantastic and enchanted world, fashioned by drops of water. The entrance to this cavern is blissfully situated on a gorge clad with wilderness. The dark passageway wriggles a way through a barrier of stalactites and stalagmites of different sizes and shapes. The ceiling is decorated with complex patterns of watermarks and scratches and hanging dripstone curtains. 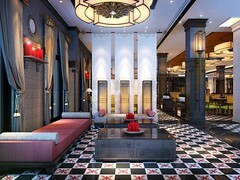 The main passageway continues its subterranean route and opens to an emerald green river dappled with pink lotus flowers. 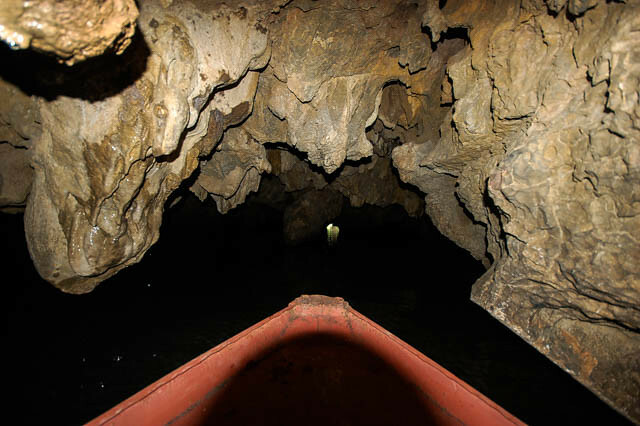 There are three caves that visitors will encounter during the cruise. Hang Ca is the first one, the largest of all caverns here, measuring 20 meters wide and with a height of 2 meters that perhaps only a dwarf can pass through standing. 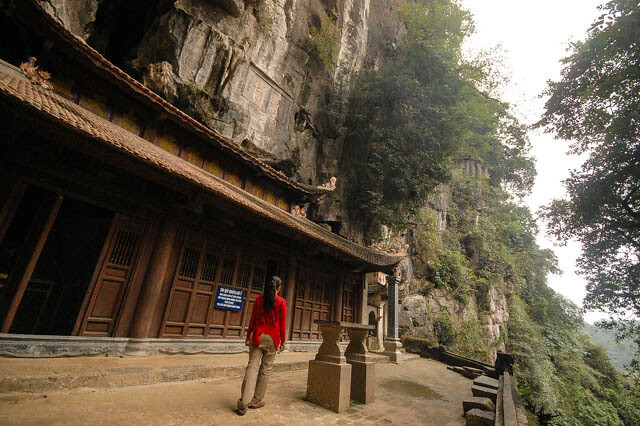 The second cave is named Hang Hai or Hang Cave Guia which is clad by majestic stalagmites. And lastly, there is Hang Ba, also known as Hang Cuoi, the smallest of them, measuring 45 meters wide. Tam Coc’s name is believed to have been derived from these caves, because in Chinese, Tam means three and Coc means caves. After the relaxing river cruise, my guide then takes me to a nearby temple, about 2 kilometers away – the Bich Dong Pagoda built on Truong Yen limestone massif sometime in 1428. 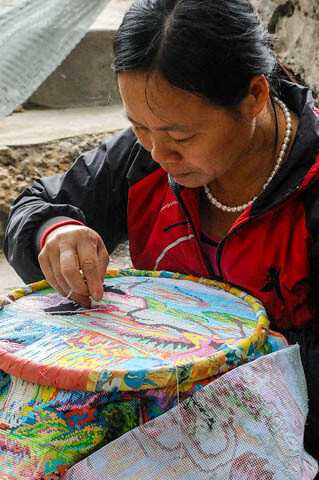 The walkway to the gate is fringed with stalls and persistent vendors greet me offering rainbow-hued souvenirs, including hand-embroidered tablecloths and handkerchiefs made by the craftswomen of Van Lam Village. The price here is cheaper than the ones sold in Hanoi. Little did I know that this landmark is actually composed of three religious structures: Hạve (lower pagoda), Trung (middle pagoda) and Thượng (upper pagoda), in ascending order. I climb the stairs to enjoy these age-old edifices and the surrounding view. Before I reach the uppermost temple, I enter Toi Cave, dubbed as the second most beautiful cave in Vietnam. This dark cavern is dappled with stalagmites reminiscent of wild animals such as tigers and elephants. I honestly find it quite ordinary, I personally think there are more beautiful caves in this country, but the view from the second to the upper pagoda is undoubtedly awe-inspiring. I carefully climb the jagged limestone outcrops to see the view of Bich Dong. One mistake I make, and I will certainly be wounded. The foreign tourist before me declines to go further, she makes her way back. But I don’t want to give up, it took time and money to take me here, and besides, I am only here once. I push myself to endure a few more breathless ascents. Finally, my effort pays off, I reach the summit. 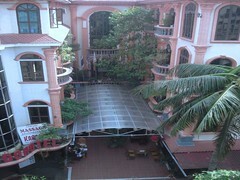 It is no wonder why Mr. Nguyen Nghiem (the father of the great writer Nguyen Du) baptized this place as Bich Dong which means “Green Pearl Grotto”. 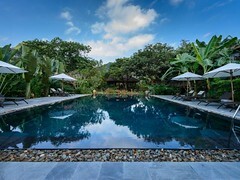 The view here is undeniably mesmeric, looming over the distance are karts outcrops that seem to point to the heavens while draped by lush rice farms interrupted by the olive-green Ngo Dong River. 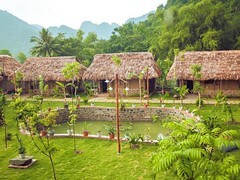 All of them play their part in creating this symphony of tranquility in Tam Coc. Looking down, I reckon, Mother Nature must have been well satisfied with her splendid masterpiece. 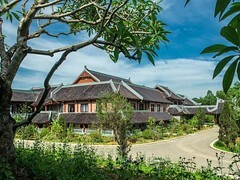 Tour includes boat cave tour in Trang An Cave Complex (boatand entrance fees included), a visit to the Bai Dinh Pagoda (largest pagoda in Vietnam), Vietnamese lunch and roundtrip transfers from Hanoi and professional private guide services. Bring hats, sunglasses and sunscreen as the boat has no roof or shade. Carry water/drinks during the boat trip to avoid dehydration due to hot weather. You are not required to give a tip. 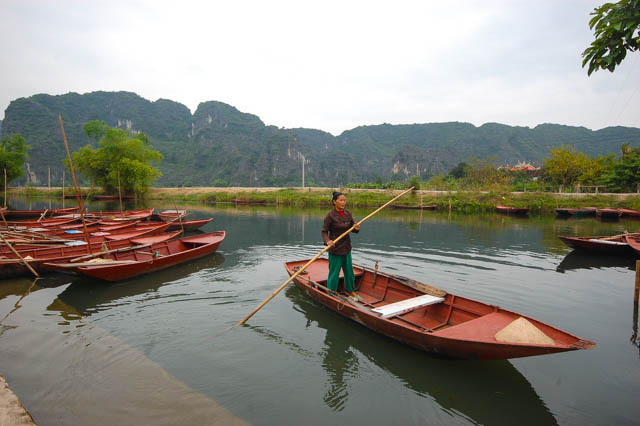 Rowers at Tam Coc and other river boat tours in Ninh Binh are notorious for asking tips. No matter how much you give them they won’t be satisfied. My rower even frowned when I gave her the tip (which she bluntly asked from me). Even other foreign tourists have experienced the same.